Fresh off 2018's collaborative LP with the enigmatic MF DOOM, "CZARFACE meets METAL FACE," the adventure continues as CZARFACE now faces off with Wu-Tang Clan's GHOSTFACE KILLAH. "Czarface meets Ghostface" brings strictly mind melting beats and bars as 3 emcees clash like villains & heroes in the Savage Land. 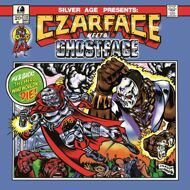 Czarface, a hip-hop & comics force comprised of WU-TANG CLAN general Inspectah Deck, Esoteric (who recently penned an X-Men comic for Marvel) and super producer 7L team up with Ghostface aka Iron-Man aka Tony Starks for murderous meyhem!